A day-to-day journal – growing local food with two acres and some tools…! Our first wood order of the season arrived a week ago, just as we ran out of the leftover from last year. It’s a bush cord. At least, that was what was ordered, bought and paid for. One bush cord of well-seasoned hardwood, in 16″ pieces. The wood is great on the seasoning end, but when I finished stacking it today, in our custom-built, holds-one-bush-cord rack (below), even taking into account the wood we burned over the last week, we are CLEARLY WAY SHORT!! I’m kinda shocked at how short we are. When I looked into what exactly a bush cord comprises, the definition seemed pretty clear: 4’x4’x8′ of tightly stacked wood. A volume measure. With 16″ pieces, that equals one long 24′ row, 4′ high. “Tightly stacked” is a little vague, but after asking around, and looking at photos, it seems like common sense: you don’t fit the wood together like a jigsaw puzzle, just stack it nice and solid. OK. I built a simple rack out of 2x4s that should fit…exactly one bush cord. Of standard 16″ pieces. It’s kind of a bush cord meter. To fit in the narrow side yard, the rack has two 12′ rails, with 4′ high ends. I stacked it reasonably solidly. And we seem to be at least 1/3 (that’s 33%!!!)…short. Global Village Construction Set: Watch This! Best laid plans begin here! There are actually a few different cord volumes but as long as you bought a cord of 16″ long logs your cord will be 180 ft. sq. Just because the guy came recommended doesn’t mean he is trustworthy. He could have been shorting people all along, or he might have just made a mistake. I would definitely call him and let him know you think you were shorted. Just my $.02. Just noticed this was from November of last year. Also curious how it worked out. There’s a company near here that sells ‘bush cords’ by dumping the wood into 4X4X8 crates. Since it’s dumped and not stacked, it’s always short. They are upfront about their methods though. recognized by add your blog.com to receive our – “Blog Star Award” ! work and dedication in providing a quality web log. 3)Web Log Everyone Will Love To Read. Don’t forget to submit your blog to our directory increase your blog traffic…. What a smart way to check the delivery. If I ever build a wood rack I will follow your way of thinking. How did it worked out? Anyway, I just want to say I admire you, I visited before your blog. I have heard of several ways to handle this situation. One of them is to have the guy stack it (you’ll have to pay extra for this). Pay him half when he arrives and half when the rack is 100% full. This only really works if you were going to pay to have it stacked anyway, since stacking is expensive and there’s no way the guy is going to sit around while you stack it just to check the measure. Another way to handle it is, like you did, to call him back and tell him you were short. IMO, this is why very, very few people (at least here where I live) sell by the cord. They typically sell by the “rick,” which is a 4×8 stack of wood cut however long they want. So they’ll say, “$50 a rick, cut to about 18 inches.” This makes it harder for you to check their math, since they can have a bunch of short pieces and as long as it stacks to 4×8, they’re good to go. The extreme end of this spectrum is people who’ll simply sell you a “truck load.” If they’re feeling particularly generous, they’ll indicate whether it’s a long-bed or short-bed. This really ticks me off, because there is just no way to know how much wood you’re actually getting and whether it’s a good price, which, if you ask me, is kind of the point. That being said, I can understand how tough it must be for the firewood guy. It’s not like he stacks it before he delivers it to you. Usually, I’ve seen them in huge piles to season, and then they load the truck and deliver, so he’s always guessing as to how much is the right amount. That being said, he does do this all day long, so he should be able to figure how much overage he needs to convert from a pile of wood to a stacked cord. I had never heard of a bush cord before, so I have learnt something useful today! In Australia firewood is just sold by the ute or trailer load, so there is no standard measure. It would be very useful to have a way to compare difference prices if you knew you were buying the same amount each time! In any case, I like the rack you built, and you’ve stacked it very neatly, we usually just end up with a messy pile and its a relief at the end of winter when the mess is gone! We had that happen a couple of time too, so now we just buy a tandem load of logs and cut ourselves…then we know that we won’t be shorted . Here in Michigan wood sells for full cord 4x4x8 and face cord 4×8 x l8 ” . Maybe you got the front row to make up for the shorter log length. They charge about $55/face cord. I like your rack idea – smart for containing it, nevermind having a good idea of how much you have on hand. Nice – and wow did you get shorted! Around here, I’ve normally seen firewood stacked in frames that look like they’re about 18 to 24 inches on a side and 3 or 4 feet tall (we don’t use our fireplace that much, so we tend to buy the little US$5 bundle at the store). I’ve also seen one farm market that sells by the shipping pallet. I think the wood folks were shocked when they realized how precise Mike was with his measurements. Thank goodness it was pretty descent wood (not too green). I can only imagine what Mike’s reaction would have been if ithe delivery had been short AND green!. I have received more loads of promised dry wood and I even had to stop burning early last year because the wood was just too green to burn. In New Brunswick (Canada) wood is always measured and sold by cord. It is known to be 4x4x8′. People who use primarily wood heat tend to gauge their energy consumption and the insulation factor of their house by how many cords they burn in a year. >I have heard of several ways to handle this situation. Owning a tape measure and having a sixth-grade understanding of math is all you need. A cord is 128 cu. ft. of firewood “ranked and well stowed” (stacked). Some jurisdictions, such as Maine, offer an alternative definition that, if thrown, it is 180c.f. for 16″ pieces. So that to me is a good alternative measure. So you measure it. While on his vehicle is usually the best — since usually it’s more or less a hexahedron and you can just measure l x w x h to figure out the cubic area. Yeah, wheel wells take out a small bit, but not a lot. If it’s far off from 128c.f. if stacked in the truck or 180c.f. if thrown it’s time to ask questions before you hand him cash or he dumps it out. A standard full size pickup truck bed is 8′ long and 4′ between the wheel wells and will need to be *stacked* to the height of the top of the cab roof in order to carry a cord (and weight wise you really should have a 1 ton (usually model names have a 350 or 3500 in them like a Ford F-350, though it *might* be done on a probably over-loaded 3/4 ton (F-250, etc). A Face Cord is a 4′ x 8′ x depth of wood amount…if the pieces are 16″, it’s 1/3rd of a cord (16″ x 3 = 4′). If the pieces are 24″ long, it’s half a cord. Some areas, like upstate NY, “face cord” is what is generally meant when someone says cord — not by law, but merely by tradition. Caveat emptor when discussing prices! My *understanding* is a “Bush Cord” is that it was pieces 4′ long. But that terminology isn’t used in my area. 4′ was a frequently used length in the days before chainsaws. They’d sell the 4′ lengths to pulp mills in paper producing areas, or bring 4′ on a horse drawn sled back to the farm where they could either hand saw or use a horse-powered or later tractor-powered rotary saw to cut the pieces down to firewood length. So far, I only posted about this one time, but the same thing happened with a second, much bigger, more organized supplier, about 30% off. And then, a third, small independent, was much closer, but still about maybe 10% short, when he thought he’d overstacked a bit to make sure. And what they’ve all explained is how their boxes were constructed specifically to hold a cord. Here, the standard piece size is 16″, so it’s 3 – 4’x8′ stacks to make a 4’x4’x8′ bush cord. That’s a lot of pieces with a big range in size, from the original log diameters, and then the size of the splits. Tumbling into a box seems to allow for a lot of variation compared to stacking. 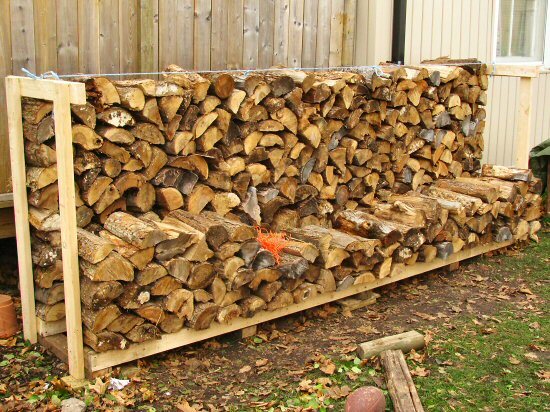 Just wondering if there are any “recommended” places to get firewood in Ontario. I know we have gotten firewood from different sources each year. It would be nice to find a good reliable and trustworthy seller. You may want to check out J & R Firewood, in Creemore, Ontario. THIS IS NOT AN ENDORSEMENT FROM HAVING BOUGHT FROM THEM. However, when researching all of this cord stuff, I ran across their web site, which has a lot of great practical woodburning info, AND I called them twice and spoke at some length to the son, both times he was super helpful and straighforward, even though I wasn’t a customer. So if you’re in their delivery area, which we weren’t, check ’em out! Simply put a proper cord is 4’x4’x8′ stacked as tightly together as it can be. Just eyeballing your stacks and doing the math versus the length of your rack I would almost say that you have a full cord there. Though it does look like you were slightly shorted, but not by a ton like many commentors would believe. Dunno how you can say that we were “slightly shorted” after reading my post and looking at the pic?! Those racks are 4′ high and 12′ wide: two 4×12 racks is the same as three 4×8 racks. We get 16″ pieces of wood, so 3 pieces end to end is 48″ or 4′. Fill 2 x 4×12 or 3 x 4×8 with 16″ pieces and you get…4x4x8. CLEARLY, to get a 4x4x8 bush cord, the front 4×12 rack should be filled to the top!!! Hi, I just had exactly the same thing happen to me yesterday in the same proportion. I thought/asked/was told I purchased a full cord and ended up getting two face cords of 16″ length logs (instead of the expected 3). After calling this morning I got an apology saying I misunderstood and it cost the same for longer logs as shorter logs so somehow I get less wood for the same price that is supposed to burn longer?????? 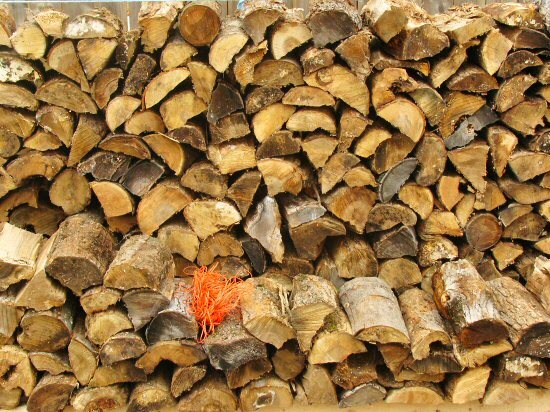 They told me I could drive by and fill my car up with some additional logs but after stacking all day yesterday I don’t want to have to move another log unless it is going into my wood stove. that is not a cord. not really close. looks more like a half cord. just lookin at it i would burn thru that in a month. wow. thats crap. how much ya pay if dont mind. I bought some firewood this week to and got screwed. :(. I ordered three bush cords, they were supposed to be 16 ” cuts, 9 4 x 8 rows. Well it got delivered and It came neatly stacked for me to see in nine rows. What I didn’t look at was the length of the cuts, they were all 13 – 14 ” instead of 16. So don’t buy from Crawfords Rest and Retreat and Wood Supply near Norwood Ontario. I called and he just got angry and call me a liar. Well, live and learn. Determining which firewood is the best for you depends upon your particular needs or your preferences. You may like a fire which produces a pleasant aroma, crackles and pops, is highly efficient, or burns most cleanly. Copyright © 2019 TinyFarmBlog.com. All rights reserved.